We had a great time at the rodeo last night! The Zac Brown Band put on a good show, though they didn’t play my favorite song (“Whatever It Is”). I seem to be cursed at the rodeo as every concert I go to, the artist doesn’t play my favorite song. Oh well. 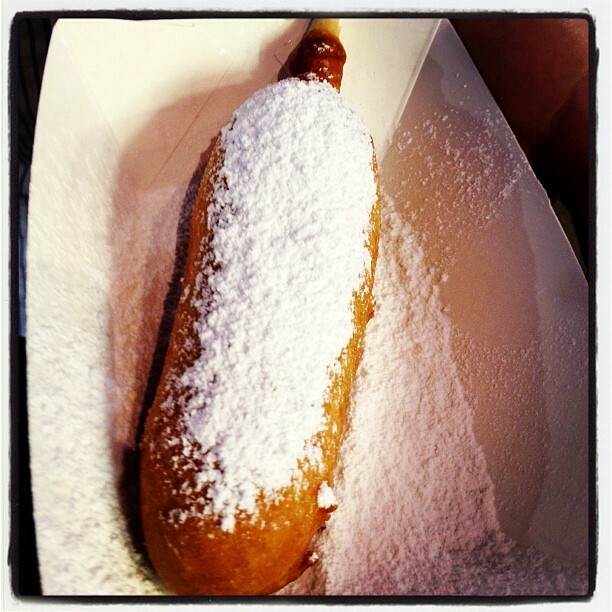 The highlight of the night was trying one of the newest fried foods at the rodeo – fried cookie dough! It was amazing. 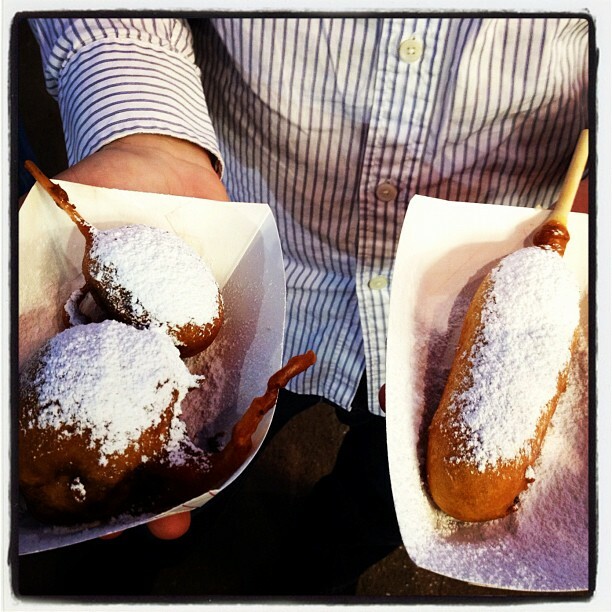 It has now topped fried oreos as my favorite rodeo food. It’s basically gooey and delicious cookie dough surrounded by a funnel cake. Yum. I have no idea how many calories it has, but I’m sure it’s a lot! My Mom tried out fried reeses (on the left), which I wasn’t a huge fan of (but I’m not a huge reeses fan either!). I was tempted to try the fried brownie, as well as one of the other new additions this year – fried red velvet cake. They also had fried koolaid…not sure how that one works! Next time! For dinner, I had a Freebirds burrito. Very tasty. If you ever come to Texas, go to Freebirds. Chipotle has nothing on Freebirds. 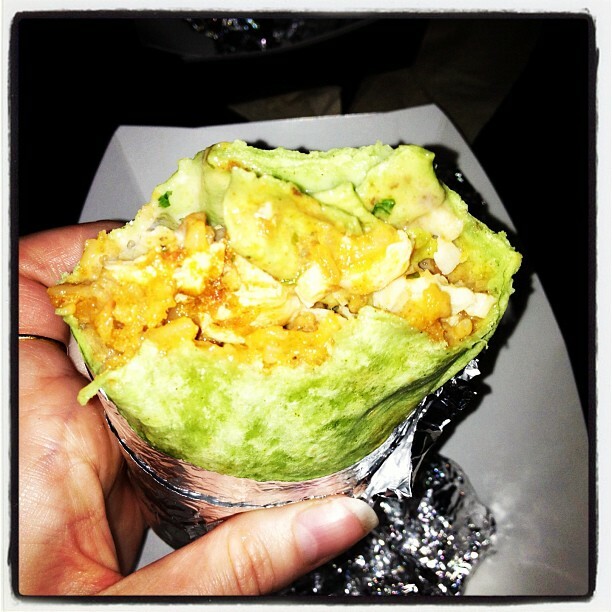 One of the best things about Freebirds is you can put chile con queso in your burrito! 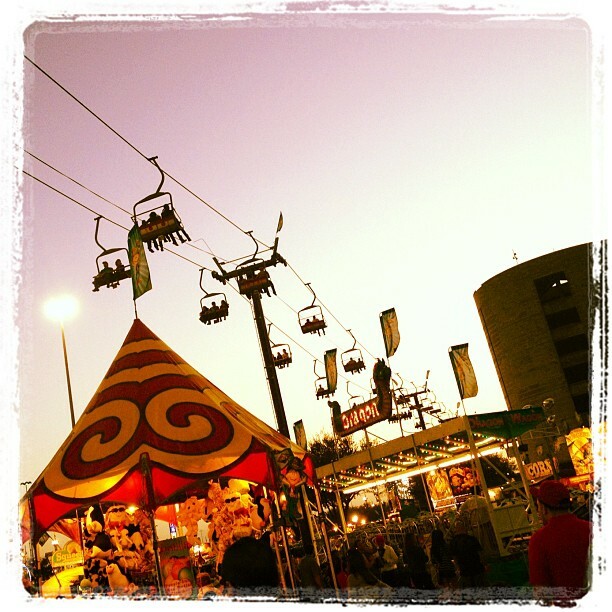 Other highlights from the rodeo included the newest ride, a chair lift. We found it hilarious (and no we didn’t pay to go on it). And then there was the camel. 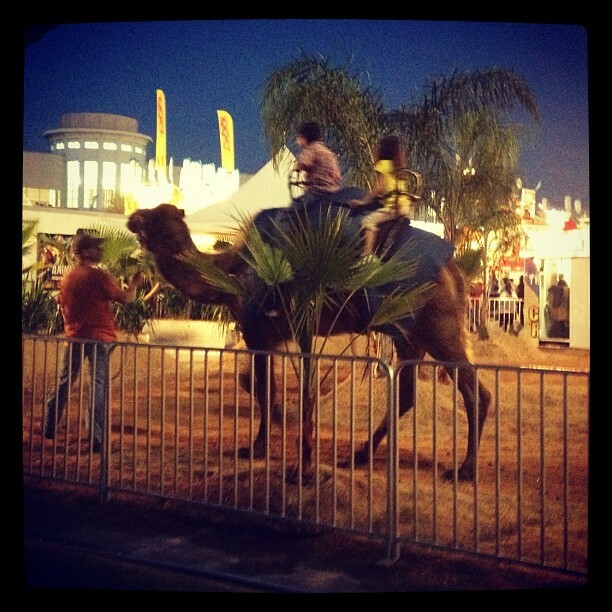 They now offer camel rides at the rodeo. Just in case you’ve always dreamed of doing that! And that’s a taste of the Houston Rodeo for ya! This entry was posted in Dessert, Mexican and tagged burrito, camel, cookies, dough, fried food, Houston, reeses, rodeo, texas. Bookmark the permalink. Aww, so glad you got your hands on the cookie dough you’d wanted! It looks WAY better than the fair food at the carnivals I’ve been to. Oh my gosh, fried cookie dough?! Wow, I bet it was delicious. I’d be all over those Reece’s peanut butter cups too. I’m really curious about the Kool Aid! How on earth do you fry liquid?